Are your old paper canal maps a little out of date? Ever planned to moor up at a pub that no longer exists, or tried to use boat services that are no longer there? Do you sometimes arrive somewhere new, only to wander aimlessly around, seeking a cash point? Problem solved, because this husband and wife team have just invented BoatSatNav! 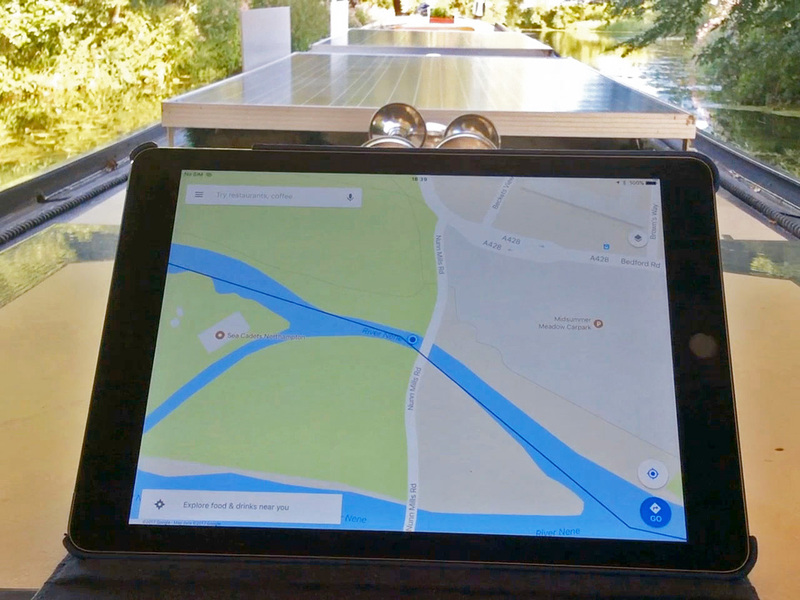 On 19th July 2017 Jan Pickles Price and her husband Haydn launched a free online canal guide that’s based on Google Maps. When I asked Jan for more information she said the initial response has been tremendous, and that she had already been contacted by the Roving Canal Traders Association and the Friends of the River Nene who wanted to find out more. They received over 100 registrations for the site on the first day. Obviously you don’t really need satellite navigation on the UK canals and waterways. What these free online guides actually do is show you all the useful and interesting things you may want to see on your journey. So chuck out your dog-eared, ancient paper maps and embrace digital navigation! This means that before you even book your canal boat holiday, or day boat hire, you can be browsing potential routes and checking out places to visit. BoatSatNav is optimised for use on mobile GPS devices such as phones and tablets but it’s also accessible online using a laptop or desktop computer. It shows lock positions, junctions, moorings and winding holes. It also displays services, (fuel, water, pump out), shops, post offices, cash points, pubs, restaurants, takeaways, surgeries, chemists, pharmacies and bus and rail connections. Jan is adding new information to the maps all the time. To access the guides on a mobile device you just need the Google Maps App and a Google account, (both of which are free.) You can also access the guides on a laptop or desktop, just using your usual web browser. The Google Maps App is currently limited to 10 shared maps, so you will need to select up to ten waterways that you would like to have access to. (You can change your choices later if you like.) For canal boat journeys setting out from the Fox Boats hire base you could choose the Middle Level Navigations, River Nene, River Great Ouse, Cambridgeshire Lodes and River Cam. Jan says, “Hubs and I put this together initially for our own use but then thought…hey! We can share this. It does use a Gmail email as it accesses Google Maps, so you will need that to make it work. Why is the site different to any of the other numerous online resources? The information is mobile friendly. You can have your tablet or phone in front of you and see all of the points of interest as you cruise along. It’s free to use, and that’s always a bonus! BoatSatNav officially launched at the Blisworth Festival on 12th and 13th August, where you can see a demonstration of the tool in action. This new website offers the kind of information that boaters only discover after years of exploring, so it is a real help to holiday makers that are new to the area. You may also like to read some of Jan’s suggestions of the best places to moor on the River Nene. PS. Don’t miss the latest canal boating news from the Fenland waterways: Sign up to follow this blog in the sidebar on the right.